Our bioGO™ BioPharma Trailers deliver rapid and flexible cGMP cleanrooms, production space, R&D capabilities and biocontainment. These units add capabilities and accelerate “speed to market”. bioGO Adaptive Mobile Platforms are configured for your required application and can easily be repurposed for biopharmaceutical process change-outs, as Germfree manufactures and inventories all core equipment. 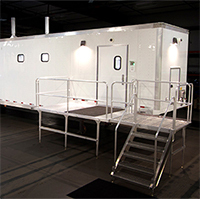 We also operate a fleet of mobile cleanrooms that meet FDA cGMP and USP 797/800 requirements. These fully self-contained units are deployed for pharmacy operations and clinical drug trials. Germfree offers rental options to match the duration of your project, including short term applications. bioGO™ Mobile Platforms offer flexible cleanroom space that is easily configured to required ISO grades as well as biological safety levels up to BSL-3. This innovative platform is optimal for a wide range of biopharmaceutical production needs, including monoclonal antibodies, therapeutic proteins, viral vector and live virus vaccines. 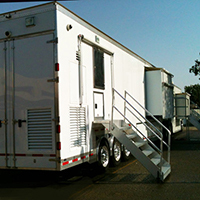 These mobile suites provide a unique solution for rapid deployment where budget, facility and timeline limitations constrain manufacturing and R&D innovation. This new approach offers an adaptive platform ideally suited to adjust for emerging biopharmaceutical processes as it utilizes Germfree’s interchangeable casework and laminar flow equipment. Multiple trailers can be joined for future expansion.